My freezer is already packed to the gills with chopped rhubarb, hulled native strawberries and a stockpile of homemade Backyard Mint Ice Cream (recipe courtesy of Jeni's Splendid Ice Creams at Home). 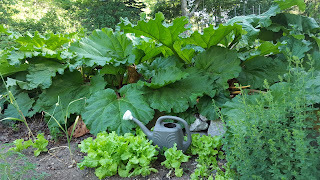 Yet, I still feel the need to buy more strawberries to make my stomach and freezer burst as well as find as many ways as possible to use up the rhubarb in Val's garden until the stalks get so fat in the July sun that no one can possibly consume and digest it. 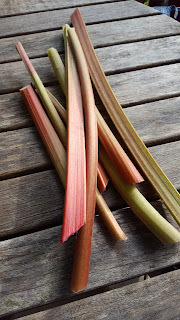 The problem is that rhubarb, while it makes a lovely tasting sweet/tart jam, it's color once the rhubarb is cooked turns into a disgusting yellowish green. Think of a runny nose when you have a very bad cold and that is the exact shade of this delicious, sour treat. Upon seeing the nauseating hue of this confection, most people run for the hills rather than slather it on buttered toast. So, I only make a few quick jars of this concoction, knowing that I am likely the only person who will dare devour it. And to be quite honest, I prefer it that way. At least I won't have to share any with the little hungry mouths in my home. But that doesn't solve my need to hoard the rhubarb since the freezer is already full. Luckily, I also accumulate recipes. I have a cumbersome file box full of recipes torn from magazines and printed off the internet. Many I have tried and use over and over again. So many more, I have yet to get to, or even remember that I thought enough of it to file it away for future use. But, as luck would have it, I did save an obscure rhubarb recipe from Mother Earth News back in April. It's kismet really, that I came across it this week, just when I needed one more reason to climb back into Val's immense rhubarb patch to harvest the last remaining edible stalks. The plants are now so gargantuan, it's getting to the point of me needing to use the largest, sharpest knife kept in the wooden block on the kitchen counter in order to hack off the plant and surgically remove the leaves that have grown as big as couch cushions. But I persevere, determined to mine every last available bite, wielding that knife as a machete, like an explorer would hack through a dense tropical jungle. All to put up few jars of pickled rhubarb. 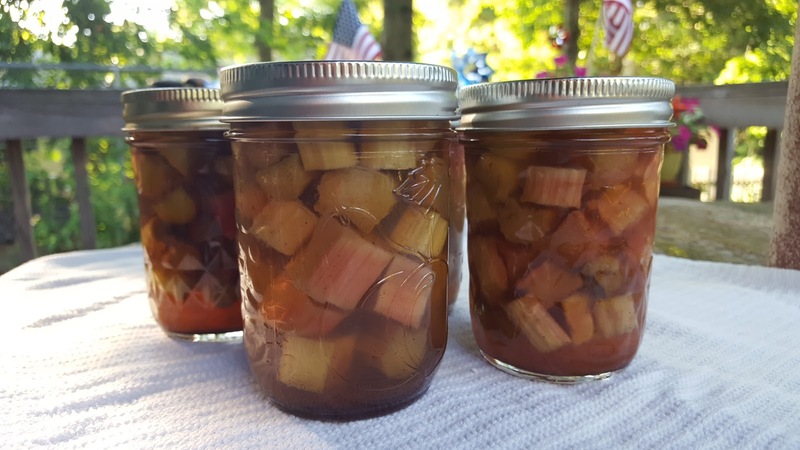 Don't be afraid of the bizarre idea of pickling rhubarb. The uber tart stalks lend themselves well to the process. And the leftover brine is so good, I want to drink it straight from the jar. So, I'll have to think of a way to use that up too, once I eat up all the marinated rhubarb. 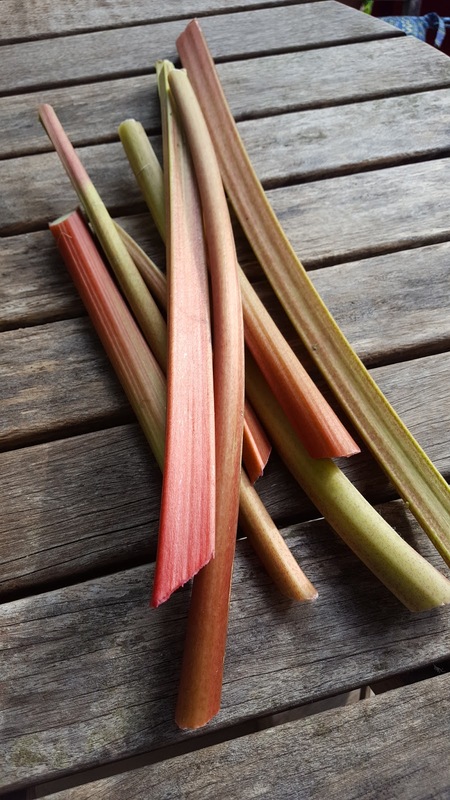 I updated the original directions of cutting the stalks into batons to cutting up the rhubarb into chunks. When I tried to bite into a long piece of the pickled rhubarb, my teeth would not cut through the stringy stalk. Very disheartening. Also, because of necessity and the fact that I store my ginger root in the freezer, I grated it instead of adding slices and I don't know where to find whole allspice, hence the use of powder. Regardless of these changes, I think the recipe is pretty damn amazing and my sister does, too. She keeps demanding more "crack" as she calls it. I guess I won't be hoarding all of these jars of pickled goodness to myself, after all. Boil vinegar, sugar, salt, grated ginger, chili flakes, cloves and allspice in a medium sized sauce pan until the sugar and salt dissolve (about 5 minutes). Strain out the solids and set the liquid aside. 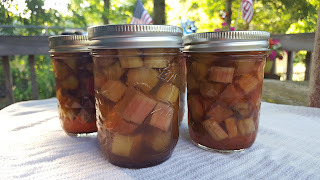 Pack chopped rhubarb into sterilized jars. Pour hot liquid over rhubarb until just shy of full. Screw on lids and allow to cool. Refrigerate for up to one month. * Do not use canning process as rhubarb tends to turn to mush in the process.